Innovative and elegant, the Bertoia Diamond Chair is a masterpiece of form and function. A work of art as well as a piece of furniture, the chair's sculptural, diamond shaped frame brings an artistic flair to any environment. Made from bended wire rods that are ergonomically curved for comfort, the chair comes with a removable padded seat. Upholstered in natural grain Italian leather and available in black, the seat creates an interesting contrast to the polished metal. The chair legs are made from powder-coated iron for strength and durability, and have shock absorbers to prevent slipping. The Bertoia Diamond Chair can be used outside with proper care and limited exposure to the elements. Designed in 1952, the Diamond Chair is part of the Bertoia seating collection, a series of strong yet airy chairs made from bended metal rods. Bertoia explains: 'If you look at these chairs, they are mainly made of air, like sculpture. Space passes right through them.' This unique design has contributed to the enduring popularity of the Diamond Chair. 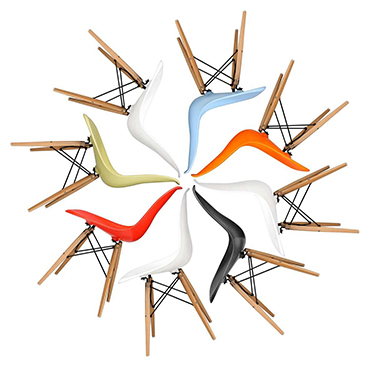 Considered an acclaimed, creative piece of modern mid-century design, the chair has appeared in many Hollywood blockbusters. These include Iron Man 2 and the Devil Wears Prada. "The urge for good design is the same as the urge to go on living."